Tonight I’m knocking back a gin and tonic to celebrate finishing a piece of software development for my client the Public Record Office Victoria; the archives of the government of the Australian state of Victoria. The work, which will go live in a couple of weeks, was an update to a browser-based visualization tool which we first set up last year. In response to user testing, we made some changes to improve the visualization’s usability. It certainly looks a lot clearer than it did, and the addition of some online help makes it a bit more accessible for first-time users. 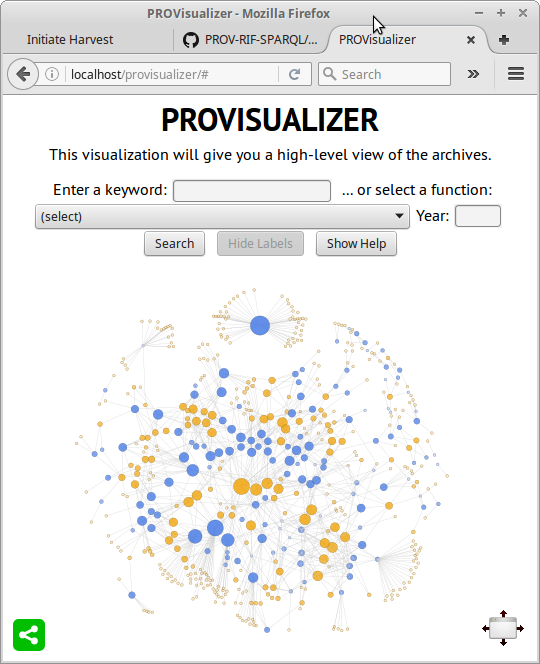 The bulk of the work, though, was to automate the preparation of data for the visualization. Up until now, the dataset which you could visualize consisted of a couple of CSV files, manually assembled with considerable care and effort from reports exported from PROV’s repository “Archives One”. In the new system, this manual work will not need to be repeated. Instead, the same dataset will be assembled by an automated metadata-processing pipeline which will keep it continually up to date as government agencies and functions change over time. It was not as big as job as you might think, since in fact a lot of the work to generate the data had already been done. In 2012, in collaboration with their counterpart agency State Records New South Wales, PROV had set up an Interoperable Data publishing service with funding from the Australian National Data Service. 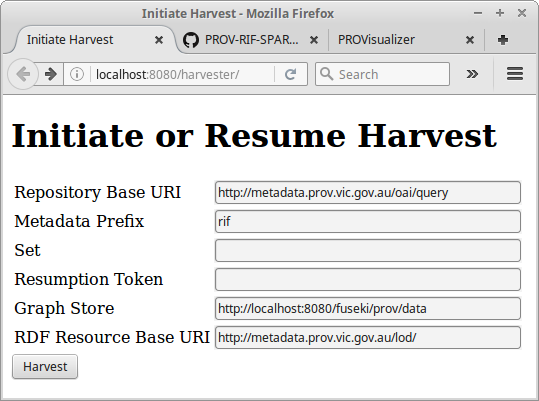 They custom-built some software to export data from Archives One to produce a set of metadata records in RIF-CS format, and they deployed an off-the-shelf software application (an “OAI-PMH Repository”) to disseminate those metadata records over the web. Originally, the OAI-PMH repository was serving data to the Australian National Data Service, which runs an aggregation service called Research Data Australia, which offers researchers pointers to all manner of scientific, historical and cultural datasets. The PROV metadata, covering the full history of government records in Victoria, is a useful resource for social science researchers, genealogists, historians, and others. More recently, PROV’s OAI-PMH repository has also been harvested by the National Library of Australia’s Trove service. Now at last it will be harvested by the Public Record Office itself. The software I’ve written consists of a web application which I wrote using a programming language for data pipelines called XProc. The software itself is open source and available on GitHub in a repository with the ludicrously acronymous title PROV-RIF-SPARQL. This XProc application tediously harvests the metadata records (there are more than 30000 of them) and converts each one from RIF-CS format into RDF/XML format. The RDF/XML data is a reformulation of the RIF-CS in which the hierarchical structures of the RIF-CS are re-expressed as a network of interconnected statements; a kind of web of nodes and links which mathematicians call a “graph”. The statements in these graphs are expressed using the international standard conceptual framework for cultural heritage data; the CIDOC-CRM. My harvester then stores all these RDF/XML documents (or “graphs”) in a SPARQL Graph Store (a kind of hybrid document store and database). The SPARQL Graph Store allows each graph to be addressed individually, but also for the entire dataset to be treated as a single graph, and queried as a whole. Finally, the RDF dataset is queried to produce the two summarised data files which the visualization itself requires; these are simple spreadsheets in CSV (Comma Separated Values) format. One table contains information about each government agency or function, and the other table lists the relationships which have historically existed between those agencies and functions. The harvester has a basic user interface where you can start a data harvest; a process that takes about half an hour to complete. In this interface you can specify the location of the OAI-PMH server you want to harvest data from, the format of the data you want to harvest, and the location of the SPARQL Graph Store where you want to store the result, amongst other parameters. In practice, this user interface isn’t used by a human (except during testing); another small program running on a regular schedule makes the request. At this stage of the project, the RDF graph is only used internally to PROV, where it functions purely as an intermediate between the RIF-CS input and the CSV output. The RDF data and the SPARQL database together just provide a convenient way to aggregate a big set of records and query the resulting aggregation. But later I have no doubt that the RDF data will be published directly as Linked Open Data, opening it up, and allowing it to be connected into a world-wide web of data.